A range card is a sketch or diagram of the terrain that a weapon is assigned to cover by fire. It shows possible target areas and terrain features plotted in relation to a firing position. The information on a range card is used for planning and controlling fire, for rapidly detecting and engaging targets, and for orienting replacement personnel or units. Therefore DA Form 5517-R, should be used to record the information. a. The symbol for the weapon covering the sector. b. 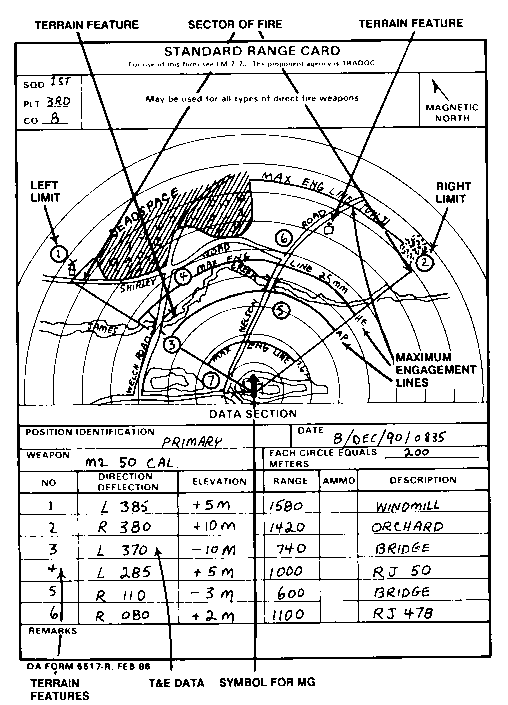 The azimuth (degrees) and distances (meters) of the firing position from an easily recognizable terrain feature. (This serves as an easy reference to locate the firing position.) If there is no easily recognizable terrain feature, an eight-digit grid maybe used. c. The boundaries of the area assigned to be covered by observation and fire. d. Areas where targets are likely to appear (engagement areas) and the range, azimuth, and elevation to them from the firing position. e. Dead space (areas that cannot be observed or covered by fire). f. The direction of magnetic north when the range card is properly oriented. • Unit designation (no higher than company). • Time and date of preparation. 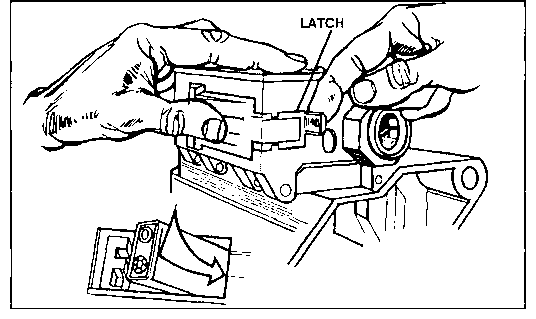 The following steps are taken to prepare a range card. (See Figure E-1, page E-3, for an example of a completed range card). a. Draw the symbol for the MG in the lower center of the range card. b. Show the sector of fire by drawing solid lines from the weapon symbol to the left and right limits. Sketch any easily recognizable terrain features that can be used to identify the sector. In the data section, indicate the magnetic azimuth and the range to the far limits of the sectors of fire. c. Place target reference points at the location designated by the platoon leader or unit SOP, and at any other locations where a target is likely to appear. Number each TRP and likely target locations in the sketch section of the range card. d. Draw a maximum engagement line across the sector of fire for the MG. These lines depict the maximum ranges at which a target can be effectively engaged. e. Show dead space or areas where targets cannot be engaged with direct fire by drawing diagonal lines across the areas and writing the words DEAD SPACE. f. Draw a magnetic north arrow on the range card to orient it with the terrain. Then add identification data - unit designation (no higher than company level), time and date of preparation, and type of position (primary, alternate, or supplementary). g. Enter the information for the weapon reference point in the remarks block on the range card. How to draw a range card?